Radiodermatitis, also commonly referred to as radiation dermatitis in medical terminology, is a symptom caused as result of using radiation therapy used to treat cancer as well as exposure to radiation during nuclear disasters. While treating cancer with radiotherapy, cumulative daily doses of radiation are given to the treatment field or target site on the body prevent normal skin to repopulate and weakens the skin integrity at and around the radiation field. Degree of radiodermatitis may be acute or chronic and encompasses localized erythema, skin shedding (desquamation), hair loss (epilation), fibrosis, necrosis, and other similar conditions. According to the WHO, the number of new patients of cancer is expected to grow by 70% in the next two decades. 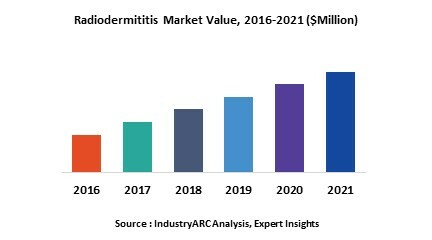 The growing number of cancer patients around the world is the chief driving force behind the radiodermititis market’s growth however higher cost and adequate infrastructure in the major parts of the world is expected to be key restraining factor for the radiodermititis market.